BUT IT’S CERTAINLY NOT ALL DOOM AND GLOOM! Despite the fact that there are now a couple of pubs closed and awaiting new landlords, there is still so much going on in the rest of the pubs in town. Just check out the ‘PUB STUFF’ at the end of this newsletter, and start to plan what you want to do, and where you want to be over the next few weeks. There are Halloween/fancy dress parties; bonfires and fireworks; music nights; general and specialist quizzes [any Harry Potter experts out there? ]; and fund-raising events for charities. What an amazing town we live in, and what an incredible job the landlords do to make their pubs interesting, vibrant, exciting and welcoming. All it takes is for you to drop in now and again to show them how much you appreciate their efforts!! All the offers will just be highlighted against individual pubs at the end of the newsletter. The cards cost a mere £10, and are currently on sale at The Curious Hop in Newmarket in Otley. The annual cards all expire at the end of July 2019, so the earlie r you buy them, the more value for money you get! [Although we will probably reduce the price later in the year – watch out for that and other merchandise coming your way soon!] Please remember – when you use the card, could you please say you are a cardholder before ordering, and confirm the savings on offer before they start ringing up the full price in the till! Sometimes new personnel behind the bar don’t know every offer that might be available either, or might have to get the discount authorised by a duty manager. We will also continue to try to persuade other pubs to join the scheme, even if they can’t guarantee a permanent fixed percentage discount. They could offer cheap entry to their quiz night, or make single spirits up to a double for £1 off, or – if they have a loyalty card – give you an extra stamp free. If you have any suggestions for offers that pubs might make [50p a pint off all beers during January, for instance?] just let us know and we’ll suggest them to landlords on your behalf. 2018 OPC AGM – AN EMBARRASSMENT OF RICHES . . . OR JUST AN EMBARRASSMENT? There was a grand total of 6 people at the AGM – including committee members! Let me begin by saying that I’m certainly not criticising or ‘blaming’ anyone for the picture I’m about to paint – and that all the views below are purely my own, and don’t reflect the individual, or collective, views of the other committee members. I am merely describing what happened; what happens every month; and what that might possibly mean about the future of Otley Pub Club and its activities. As for ‘the riches’ – well we do have 500-plus members; we do still have more than half a dozen active committee members; we manage to produce a regular newsletter and maintain a website; we’ve created a paid-up members scheme that gets discounts off food, drink and accommodation in Otley; we put on events ourselves, as well as collaborating with other town organisations and even the BBC; we’re about to reach our 10th anniversary; AND Otley still has over 20 pubs – and we might have contributed to that! Many other completely voluntary community organisations would be envious of us, I’m sure. BUT – and it’s a big but – we do wonder sometimes whether anyone actually cares, or whether the half dozen or so of us are just doing it for our own satisfaction. [I say sometimes, because I do receive messages and emails of appreciation from time to time. Then it becomes evident that members DO read the newsletter; that they DO want to know what’s happening at the pubs, and hear about their future; and that they enjoy the events that we manage to promote from time to time.] However, for 5 years I’ve been sending out details in advance about our monthly meetings – which pubs we’ll be at, the specific times and directions on how to get there, and a message saying we’d love to meet you and have a beer [or a non-alcoholic libation of your choice]. We met on the first Thursday of every month for years, so that everyone knew exactly when they could come to meet us, until eventually we changed the night to make it easier for all our active committee members to attend. So what will happen now we’ve failed to get any volunteers to fill the posts of Secretary and Membership Secretary (and Pub Liaison Officers)? Over the whole of that 5 years, I think fewer members have attended the monthly ‘social’ meetings – IN TOTAL – than the number of people on the committee! So maybe this is finally the time to admit that we have a membership who DO appreciate the information and events, but who aren’t really interested in helping to deliver them. However, without a membership secretary, there is no-one to add new members to the membership list, or delete leavers; to keep the 500+ email addresses up-to-date; or to send out emails to everyone on the list. As long as I keep producing a newsletter, I will continue to add it to the website, but you might have to remember to go and look for it yourselves! And there’s not much point in continuing to send out an invitation to meetings that no-one ever turns up to! As long as existing Premier card holders have a valid card, and the pubs continue to offer discounts, they will still be able to use them. But there will be no point of contact for new cardholders, and no records of existing cardholders – and probably no continuation of the scheme next year. With no single contact point for receiving mail from the Pub Owning Businesses [POBs] or from individual pubs in town, or to be the initial contact for anyone wanting to get in touch with OPC for the first time, our business with the outside world will dry up. Our lines of communication with Otley Town Council, Otley Chamber of Trade, Otley BID, Otley Town Partnership and every other organisation in town will become confused or cease to exist. Even the committee members will find it difficult to keep in constant contact with each other if no-one has the responsibility for administering and maintaining the day to day business of the club and letting everyone else know what’s happening. That remains to be seen, but I guess the answer is both no, and yes! I’m sorry if this sounds selfish, but I will resist any temptation [or persuasion] to carry on undertaking the responsibilities of Secretary and Membership Secretary from now on. Other committee members will no doubt try to do as much as they can, when they can, but without any direct allocation of ongoing responsibilities it remains to be seen how much that will achieve. What’s more [as I said at the AGM], putting more pressure on existing committee members might well make them emulate me in ditching their specific officer responsibilities altogether. So what’s the answer to this ‘doomsday’ scenario? There are no easy answers. My own suggestion at the AGM [and remember these are ALL just my personal views until the full committee have had a chance to discuss them] was that we need to go back to basics. We need to re-examine our aims and objectives. We need to decide who we are here to ‘serve’ – is it the publicans, Otley Pub Club members or the town itself? Or are we purely trying to save the ‘traditional’ pub buildings – all possibly to be owned by POBs, and managed by short-term tenants who might be more interested in getting free accommodation for a while than providing a long-term quality service to Otley’s pub-goers. [And I don’t include any current landlords/tenants in that description!] Alongside that, we have to discover whether our clients, customers, audience – call them what you will – really do NEED us. Then we have to decide what we need to produce in order to deliver our objectives to the requisite ‘clients’ – do we still need meetings; newsletters; Premier cards/merchandise; Ale Trails; and/or events? Or can we just wait for an individual ‘need’ to arise, and then mount the white chargers and ride to the rescue? As my next job [as a committee member, NOT as secretary – see avoidance of temptation above!] I’ll be drawing up a suggested agenda for a Special General Meeting to discuss the lot! BBC Radio Leeds have been in touch with us, and have asked us if we would help them to deliver a fun pub quiz/crawl in town on THURSDAY NOVEMBER 15th. The idea is to hold a quiz with 4 rounds, in 4 separate pubs, with all the participants moving on from one pub to the next at the end of each round! We’ve already visited half a dozen pubs with a producer and technician from Radio Leeds, and we’ll soon be able to give you all the details about how you can join in. [So watch out for a separate email coming up soon.] They even managed to get a variety of raffle prizes from some of the businesses in town, so even if you can’t make it to the quiz you’ll still be able to support a great cause AND have the chance of landing a fabulous prize as well! BEST PUB FOOD IN THE COUNT(R)Y? In the last issue we had a link to the latest CAMRA list showing the ‘best’ pubs in the country. Although I keep emphasising the fact that we really only actively support and promote pubs in Otley, I’m about to go further afield again for those of you who are interested in pub food when you’re out and about in Yorkshire. Last weekend’s ‘i‘ newspaper contained a list of the best British pubs for food, according to The Good Pub Guide 2019. The Yorkshire ‘winner’ was The Shibden Mill Inn in Halifax – an “Interesting 300-year-old pub with four real ales and inventive bar food.” Is the short version. OK, I’m not exactly “Breaking Rocks in the hot sun” just yet, but if you wonder why I keep going on about copyright and permission to use photographs and images, it’s because we recently received an ‘enforcement’ email from a company called PicRights. They “provide copyright compliance services to third-party content owners, including Agence France-Presse [AFP]”. They had found a copyrighted AFP photo on a 2-year-old Newsletter that was still on our website, which I had picked up from the internet and copied without properly checking that I needed to buy a licence before using it. At the time of writing, I have no idea how much we will have to pay, but internet forums are full of stories about this company and its ‘enforcement’ tactics, and none of them are pleasant. I don’t expect it to be cheap! OK, it was my fault – but there are obviously lots of other people out there with personal blogs or not-for-profit newsletters like ours that have fallen foul of the same pitfall. So let this be a lesson to all of you – if you aren’t 100% sure that you’re allowed to use an image, then don’t risk it. There are lots of internet sites that allow you to use their images without paying for the privilege. Some of them might ask for specific attribution, or that you use the image only for ‘editorial’ use [ie basically alongside news stories and non-commercial], but others don’t even demand that. The one I used above and here – Pixabay.com – has 1.5 million images, but there are others like Pexels, Negativespace, Stocksnap and Unsplash to name just a few. Anyway – you might notice a change in the amount, or relevance, of images in the newsletter from now on, as I try to keep my nose clean. FREE DRINKS AT OTLEY COURTHOUSE THIS FRIDAY! You’re thinking “nothing’s ever free”, right? Well, OK – but if you buy a ticket to see ‘The Thinking Drinkers: Pub Crawl’, the five drinks are definitely included – ‘free’! The Thinking Drinkers are Ben McFarland and Tom Sandham, who not only have a pedigree in award-winning writing about, and knowledge of alcoholic drinks, but have also sold out their comedy shows at Edinburgh Fringe since their debut in 2011. If you go to their website, not only can you see the five drinks that you’ll be getting on Friday, you can also sign the ‘long live the local’ petition to help save pubs, check out their podcasts and lots more. Friday night’s show is “a brand-new, hilarious, intoxicating bar-hop through history. Enjoy five free drinks as the award-winning experts take you from the symposiums of Ancient Greece to the classic British boozer via Wild West saloons, Victorian gin palaces and the secret Speakeasy. You’ll learn a lot, you’ll laugh a lot and, don’t forget, you get five free drinks. “ I’ve got my tickets – you don’t often get the chance to see a show like this in Otley [in fact Otley Pub Club would have been proud to put this on ourselves, so many thanks to Otley Courthouse for saving us the bother!] – so why not join me? Really? You’ve probably seen recent headlines saying that a quarter of young people are now abstaining from alcohol consumption. Your own experience of walking round Leeds city centre on a Friday night might make you doubt that – so where do the figures come from. You might have seen the figures reported as coming from the Office of National Statistics, or the Department of Health, and probably thought they reflected an up-to-date picture. But it seems they appeared in this article by BMC Public Health, and are based on figures from “Repeated cross-sectional surveys in England 2005-2015”. A very brief look at their research indicates that people who are unemployed and/or from poor backgrounds drink less, as do those suffering ill-health, and those from different ethnic/religious communities. Of course, the media [and the Government?] love a good story like this, just as they love to show young people on pub crawls on a Saturday night falling over in the streets, or brawling drunken football fans – and then complain about the ‘binge-drinking’ culture in this country! It’s almost as though they are all adopting a ‘good cop, bad cop’ routine to stop everyone drinking – one minute telling us we’re all doing very well, and the next saying we’re all incorrigible drunks! As Alex Matthews-King says in this article in The Independent, “The conflicting alcohol advice is enough to make anyone need a drink”! AND IF THE HEALTH POLICE DON’T GET YOU . . .
. . Global climate breakdown will! An article in The Guardian newspaper on Tuesday October 16th said that barley shortages and dramatic price rises are likely, when extreme heatwaves and droughts affect the crop over the coming decades. This could mean a drop in beer production in some countries in Europe by as much as one third. Still, if the statistics in the previous article are true, enough young people are giving up alcohol for there to still be enough left for the rest of us – so that’s alright then! Or [Heaven forbid!] we could stop eating so much meat, as only 1/6th of the world’s barley harvest goes to brewing, and the majority of the rest goes to feed livestock. So the choice is yours – meat, or beer? AND FINALLY – IF YOU CHOSE BEER OVER MEAT ABOVE, GET ‘PANTSDRUNK’! We usually only include here anything special or extra [or even extra special!] going on over the next month. So although we’ve included all 21 names here, to remind you what they are, if no events are mentioned, don’t worry – it hasn’t closed [apart from The Rose & Crown and now The Bay Horse], and the regular weekly quiz, open mic or whatever will still be on. We’re constantly updating our website to try to include all those regular events so you can check them out at any time. Information changes all the time, so you can never be 100% sure, but we’ll do our best. Sometime soon we’ll also link each pub below to its page on the OPC website. Friday October 19th a DJ vinyl night, which might be repeated monthly. Various Live Bands, Tombola and other activities to raise money for a cancer research. Every Tuesday from 9:00 PM on, there is a folk play along upstairs. 27/10 Halloween Party. Free shot on entry for all in costume and one gallon of beer for winner of best costume.
. . . pending! . . .
We are looking for a food orientated person to Join us. Potentially someone with a traditional approach but a bit of modern flair, prepared to open for breakfast. Please Leave your details either at the pub or DM us. We are also looking for local musicians to play on a regular basis, acoustic type sets covers yes but no clubland karaoke type pls. Again call into the pub and leave your details or DM us. CURRENTLY CLOSED – WATCH FOR UPDATES. PART-TIME CHAMBER MAID/CLEANER REQUIRED. Please contact Marie or a member of staff in the Hotel. We haven’t been able to discuss the existing offer to OPC card holders with the new management yet, but it should still be 10% off food AND off room bookings. Please check with staff onsite before committing to expenditure though! Check the facebook page regularly for updates on music and quizzes! Saturday November 3rd Bonfire Party. Fires lit at 6pm and fireworks from 8:30. Pie and peas, jacket potatoes and an outside bottle bar. New menu coming up, with burgers and tapas included. New bar line-up will have 4 cask ales – Tetley’s, Wainwright and 2 others. Plus – Symonds cider, Guinness, John Smith’s, Foster’s, Moretti and Amstel. We’ve had an initial discussion with Geoff, the new landlord at The Fleece, and he’s willing to continue an offer to OPC card holders. We’ll let you know what that offer is as soon as they are agreed. Finally, my usual apologies for errors and/or omissions. If you are receiving these newsletters and any other correspondence from Otley Pub Club by email, but you no longer want them, just email the return address and let me know. On the other hand, if you stop receiving our newsletters in future but you still want to be a member, something’s gone wrong! 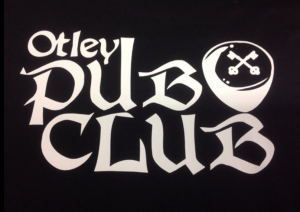 Remember this email address for the future – secretary@otleypubclub.co.uk , or get in touch via the website and I’ll put you back on the mailing list right away. Thanks!